Read the full press release from Urban Milwaukee here. 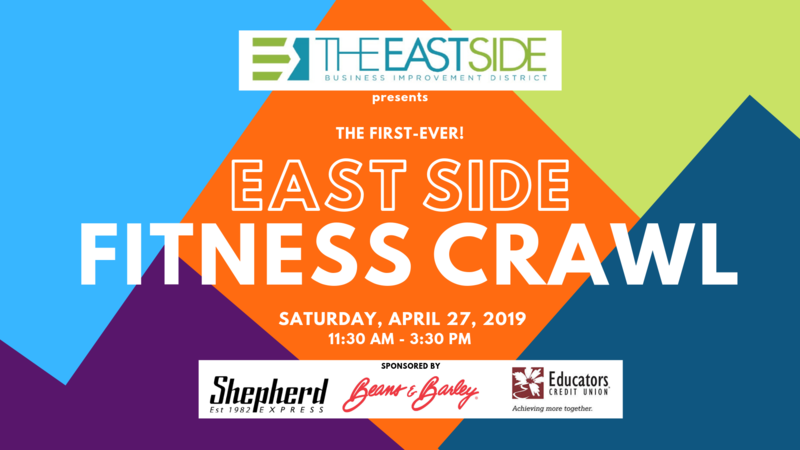 The East Side Business Improvement District is excited to announce Wisconsin’s first-ever fitness crawl coming to the East Side on Saturday, April 27th. A fitness crawl is a new concept to Wisconsin, but there are several that take place throughout the U.S., mainly on the coasts. It’s like a bar crawl, but instead of hopping bar to bar for drinks, participants will run and walk from fitness facility to fitness facility and try a new exercise at each. “We’re so excited to be able to bring this concept to the East Side,” says Elizabeth Brodek, Executive Director of the East Side BID. “As the East North Avenue area has evolved over the years, there have been a lot of fitness facilities and healthy living options coming to the neighborhood. I’d seen the Fitness Crawl concept in other areas and thought it would be a great opportunity to give people something new and fun to do on a Saturday, and highlight the variety of fitness and healthy lifestyle options we have on the East Side.” Six facilities are participating in the Fitness Crawl this year: Shred 415, Crossfit 414, East Side Pilates, East Side Family Chiropractic, Urban Om, and Yoga Six. The schedule provides participants a lot of fun, some sweat, and even a beer to top it all off. From 11:30 a.m. to noon, participants will meet at Adventure Rock and go to their respective facilities from there. From noon to around 2 p.m., participants will “crawl” between either Shred415, _____ OR Crossfit 414, _____. After the crawl, all are welcome to join for a beer at Good City Brewing’s East Side location. “It’s a kind of detox to retox,” says Brodek. Tickets are $40 and you can sign up at TheEastSide.org or through the event’s Facebook page. Events like this would not be possible without the generous support of our supporters: Shepherd Express, Wisconsin Educators Credit Union, and Beans & Barley.